The Chilkoti group carries out research in two areas: (1) Biomolecular Materials, with a focus on genetically encoded stimulus responsive peptide polymers and fusion proteins for application in protein purification and drug delivery; and (2) Biointerface Science, with a focus on protein-polymer conjugates, the development of low-cost, point-of-care clinical diagnostics, and plasmonic biosensors. D. Y. Joh, Zimmers, Z. , Avlani, M. , Heggestad, J. T. , Aydin, H. B. , Ganson, N. , Kumar, S. , Fontes, C. M. , Achar, R. K. , Hershfield, M. S. , Hucknall, A. M. , and Chilkoti, A. , “Architectural Modification of Conformal PEG‐Bottlebrush Coatings Minimizes Anti‐PEG Antigenicity While Preserving Stealth Properties”, Advanced Healthcare Materials, vol. 1801177, p. 1801177, 2019. S. A. Costa, Mozhdehi, D. , Dzuricky, M. J. , Isaacs, F. J. , Brustad, E. M. , and Chilkoti, A. , “Active Targeting of Cancer Cells by Nanobody Decorated Polypeptide Micelle with Bio-orthogonally Conjugated Drug”, Nano Letters, 2018. S. Banskota, Yousefpour, P. , Kirmani, N. , Li, X. , and Chilkoti, A. , “Long circulating genetically encoded intrinsically disordered zwitterionic polypeptides for drug delivery”, Biomaterials, vol. 192, pp. 475-485, 2019. Congrats to Samagya and Tosh on their new paper. Their work on creating a new stealth material has also been highlighted in Science Translational Medicine. 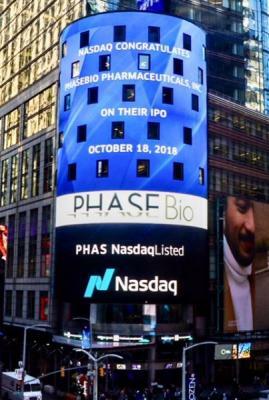 After a long saga, PhaseBio Pharmaceuticals, a startup cofounded by Tosh, finally goes public on the NASDAQ.